Phil and a group of six friends decided to visit IT Lake Monster fishing for monster freshwater predators. On arrival at the lake the seven anglers started to fish with Cultiva lures from various parts of the lake. The angler’s steadily began to hook up on Pacu and Alligator Gar throughout the morning with several Redtail Catfish and Asian Redtail Catfish also falling for the angler’s artificial lures. Action was fast and furious throughout the morning with all of the angler’s catching monster fish on the lure. After a change of tactics in the afternoon the angler’s began fishing with float fished Tilapia livebaits and mackerel fillet deadbaits. Regularly baiting with chopped fish saw the predator’s homing in on the baited areas with multiple takes from several rods at the same time on a few occasions. The group of angler’s was composed of several experienced fishermen in addition to several newcomers to the sport. As the afternoon’s fishing continued a large shoal of Redtail Catfish moved into the area greedily pushing out any other predators in the area and gorging on the angler’s baits. 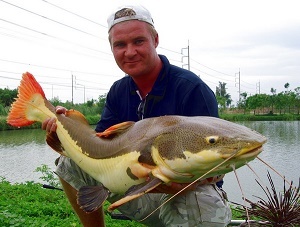 In the following few hours every angler managed to land Redtail Catfish with some specimens approaching the 30kg region. After a quiet thirty minutes one of the angler’s received a high speed take and on setting the hook into the unseen predator were greeted by an Arapaima breaching the surface whilst angrily shaking its head. After several heart stopping minutes the Arapaima was landed and carefully placed into the recovery cradle. 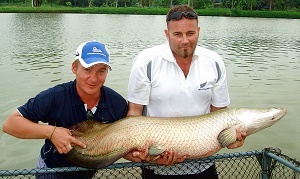 The Arapaima was allowed a period for recovery before it as quickly photographed and released back into the lake. At the end of the highly productive days fishing at IT Lake Monsters Phil and his companions had amassed a whooping eighty five fish capture topped by numerous Redtail Catfish to 30kg’s+ and a beautiful Arapaima of an estimated 25kg’s.